5.8GHz Wireless Receiver IC, AWI5822 Receiver IC - AIRWAVE Technologies Inc. 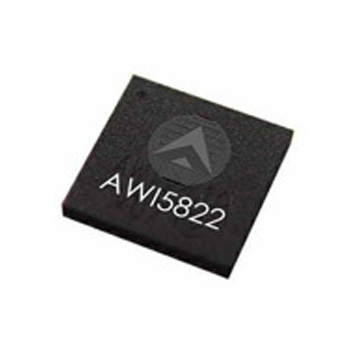 The AWI5822 is an integrated single chip receiver designed for analog A/V sender and wideband digital FSK receiver operating in the 5.8GHz ISM band. The receiver IC consists of a fully integrated frequency synthesizer, LNA, Mixer, IF Amplifier, PLL FM Demodulator, Audio Demodulator and Audio OP Amplifier. The IC is provided in 48-lead QFN7X7 package and is designed to provide a fully functional FM/FM receiver.